Games, Apps, Social Media, & More! TravelTab comes preloaded with a wide variety of apps, games, and entertainment to enjoy on-the-go, wherever you are. Stuck in a boring hotel room staring at the ceiling? Three-hour layover at the airport? TravelTab is there. 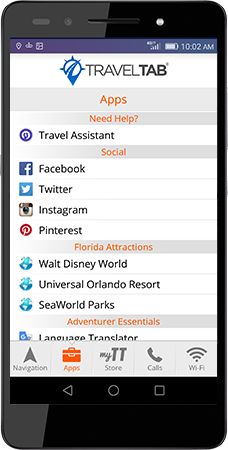 Our exciting collections of apps will keep you, your friends, and family entertained!